← THE SILENCE OF SARAH IS NOT THE SILENCE OF FRANCIS. FRANCIS WILL NOT SPEAK WITH THE CARDINALS OF THE DUBIA EVEN THOUGH IT IS HIS ROLE TO SPEAK FOR GOD. The message sent by Benedict to be read aloud at the funeral of Cardinal Meisner is generating a great deal of buzz in Catholic circles, and for good reason. Even so, some very important aspects of the text don’t seem to be getting nearly enough attention. Before we get to that, however, let’s take a moment to consider just how extraordinary this situation truly is. We have good reason to believe that Benedict is a man “under wraps,” if you will. One might even suggest that he is being held captive to some extent. Yes, I know… It sounds like a Dan Brown novel, but let’s not forget yet another bombshell that Benedict managed to lob into the public record; this one dated October 2014. Recall that Benedict had responded by letter to an invitation that he received to participate in a Pontifical High Mass as part of a Summorum Pontificum pilgrimage in Rome. Benedict plainly, albeit cleverly, informed the world that he is not “allowed an exterior presence” unless personally invited by Francis. Not allowed! How did we get from choosing “a life dedicated to prayer” to becoming a “cloistered monk” who can only leave his cloister when personally invited by the Pope? The solitary conclusion that can be drawn from this is that the veritable imprisonment of which Benedict spoke isn’t his own idea; it had to have come from his “superior,” that is, Francis himself. Benedict is not one to shoot from the hip. He chooses his words carefully. Of this we can be especially certain when it comes to a written text, and this applies to both the letter of 2014 and the one that we’re about to discuss. With this in mind, let’s now take a closer look at the message that was read aloud at Cardinal Meisner’s funeral. First, it seems obvious that the two men had a close relationship and spoke rather regularly. 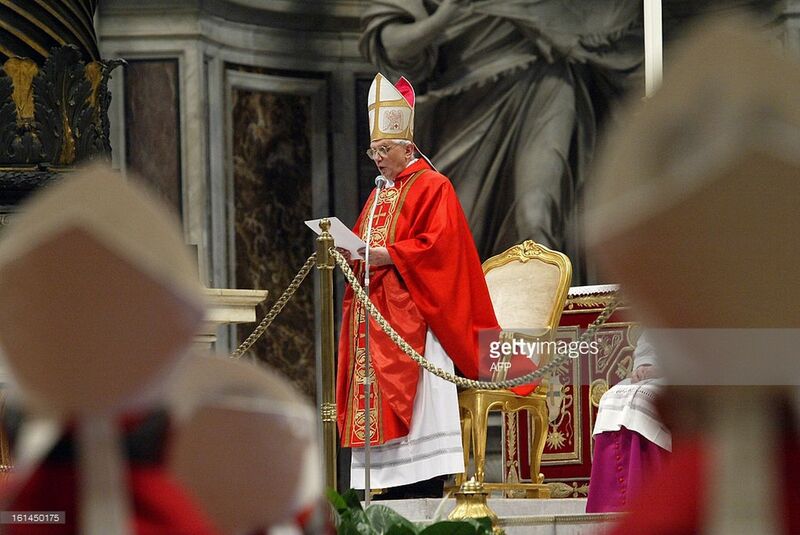 We are told, in fact, that they had spoken just the day before the cardinal died. From the content of the message, one gets the impression that the two men had a “fraternal” relationship. Benedict went on to relate concerning their final conversation that Cardinal Meisner was pleased to be on vacation. This is just the kind of thing one might expect to come up when good buddies shoot the breeze, right? Sure, but don’t be fooled. In spite of however many years their friendship went back, Cardinal Meisner was “old school” enough that there is little doubt that he saw his relationship with Benedict primarily as one of Holy Father and son. In other words, Benedict was someone from whom the cardinal could seek guidance, and we can be certain that it was always carefully considered when given. Note that Benedict wrote of the cheerfulness, joy and confidence at which Cardinal Meisner had arrived. Evidently, he was Meisner’s confidant even prior to this point; presumably in the lead up to the dubia. Firstly, that Meisner would have failed to seek Benedict’s counsel before participating in the dubia, and secondly, that he would have added his name to the text had Benedict counseled against it. I get the sense that Benedict may have been speaking of himself to some extent – learning to let go in this last period of life; arriving at a place of relaxed cheerfulness, inner joy and confidence in spite of the unprecedented turmoil in the Church (to say nothing of one’s own contribution to it). Either way, I think it’s safe to say that Benedict had a hand in leading his son, Cardinal Meisner, to this point of resignation (no pun intended). Again, let us be certain that Benedict has chosen his words very carefully. With this in mind, it would seem rather obvious, to me at any rate, that Benedict is calling our attention back to the now-famous words that he had spoken in his homily for the Pro Eligendo Romano Pontifice, the Mass for the Election of the Roman Pontiff, offered just prior to the conclave of 2005 that elected him pope. In this, Benedict – a veritable “cloistered monk” beholden to the whims of his “superior” – is providing a masterclass in Romanitas. He is telling all with ears to hear what he really thinks of the Bergoglian enterprise! In any case, it is no coincidence that we were invited to reconsider, in light of current events, that portion of Cardinal Ratzinger’s 2005 homily wherein he spoke of being “tossed about,” and this just prior to his comment concerning the Church of today being like a boat on the verge of capsizing. It is helpful to know that this imagery is Scriptural in a twofold sense. In 2017, by contrast, Benedict is calling our attention back to his words of 2005 while speaking of the present state of affairs inside the Church. He is telling us that the “dictatorship” has entered her very bosom. Yes, I understand, it entered primarily via the Almighty Council; a point lost on men like Benedict, but be that as it most certainly is, his indictment of Dictator Bergoglio stands. Wicked, crafty, cunning, lying in wait to deceive… A man who does not recognize anything as definitive and whose ultimate goal consists solely of one’s own ego and desires. Is this not a fitting description of he who masterminded the Synods in order to pave the way for Amoris Laetitia? As I stated, the seafaring imagery under discussion is Scriptural in a twofold sense. The second concerns the Church as a boat that has taken on so much water as to be on the verge of capsizing. From this, we can glean a couple of things. Your Church is beaten and bloodied. Where is your Lord now; sleeping? Through the eyes of faith, however, while we recognize the severity of the ecclesial crisis as much or more than anyone, we know that it only appears as if Our Lord has left us to perish. We know that He is ever the true Head of His Church, and He will not let her fail. More specifically as it concerns Dictator Bergoglio, this scene from the Gospels is highly relevant. In the above-mentioned scene described in Matthew’s Gospel, Bergoglio is represented (if you will allow) by Peter who is among those who ask of Jesus, What manner of man is this? Long story short, he knows that Jesus is a man, but he doubts that He is God. As I argue in the post linked above, the entire Bergoglian menace rests upon just such a Christological heresy; namely, doubt concerning the divinity of Jesus Christ. Bishops of the world, are you listening? Indeed, Benedict is trying to tell us all of the entire situation both HE and THE ENTIRE CHURCH is presently in. The thought of him being a ‘prisoner’ came to me a few years back when he celebrated his priestly anniversary and addressed Francis thanking him for his ‘protection.’ There were very many at that time that thought that Benedict was finally showing his true ‘colors’ as a ‘Francis Man’, a Modernist that had finally ‘come out’ so to speak, as he was able now that the roll of Peter he had been shed by him. That theory was nonsense then, just as it is nonsense now, as a good number of people still cling to that theory. The ‘address’ to Francis on that day was so foreign to Benedict’s way of expressing himself, by 180 degrees no less, that I really don’t understand why most did not see it. Oh yes, there were some that were suspicious, but they were disregarded by most as the ‘tin foil hats’ people. That address to Francis screamed ‘this is not really ME’ speaking. It was like he was ‘programmed’. It actually gave me chills to watch that video. The first thought upon watching him was: “What in the world have they done to that poor man?! !” “Have they DRUGGED him, or WHAT??! !” That said, it is a mystery that he is somehow able now to speak to the world in the ‘Benedict fashion’ warning and almost pleading with those faithful Churchmen still left of what’s to be done now in the face of the apostasy in the Papacy of Francis. “A cloistered monk ” who is “not allowed an exterior presence” Benedict XVI is a prisoner.